Winner of Most Promising Director and Most Promising Actor for Kodi Rasheed in the 27th Malaysia Film Festival, "Ophilia" offers much entertainment through a rather unusual style. 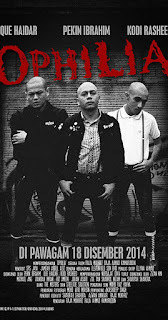 Uji, Ozzi and Totoi are three skinhead friend that have come together through their common love for punk music, although their background is completely different. Uji is born in a privileged but detached environment, Ozzi is very poor and has a father who abuses his mother, and Totoi, who eventually becomes deaf after a fight, has to work as a tailor in order to help his mother. The three of them spend their time roaming around the streets, listening to punk music and getting into fights. Eventually, one of their friends gets beaten by the members of a local gang, and the three of them decide to exact revenge. However, their "mission" is interrupted when Uji comes across Ophilia, a transsexual who functions as negotiator for the biggest triad in Kuala Lumpur. In a freak accident that involves Ozzi, Ophilia is killed, and a series of events initiates, that eventually has the three friends performing an armed robbery in order to compensate Ophilia's syndicate. The unusual tactic I mentioned in the beginning is that Raja Mukhriz seems to have combined elements from a plethora of genres, styles, and even stories and characters. In that fashion, the film functions as comedy, drama (even melodrama at some points), action, exploitation, a bit of art-house, and occasionally, even as a punk music video. At the same time, one could find elements from noir films, much retro, a bit of the excessiveness in the script that could be found in Guy Richie's films and some in Tarantino's. Particularly the story seems much more like a collage of ideas (even different short films one could say) than a single, flowing idea, as it occasionally touches the borders of the absurd. For example, Ophelia only appears for a couple of minutes in the film, and Uji, who is the narrator and, supposedly, the main character, actually takes the back seat to Ozzi's arc, which is the main source of drama in the film. The same applies to the production values, as Afiq Moshin's cinematography occasionally looks extremely retro, through some red hues much reminiscent of 60's productions, and occasionally quite contemporary, as in the scenes in the clubs and the streets. Expectantly, the editing follows the same path, with the quick and abrupt cuts (the Guy Richie style I mentioned) giving their place to long one-shots, most of which appear in the dramatic sequences. However, Mukhriz manages, in a way that is quite difficult to distinguish, to make all these different elements come together, through the concept of male friendship and the use of punk (and a bit of heavy metal) music, which seems to fit the chaotic nature of the film perfectly. Kodi Rasheed is quite good as the almost deaf Totoi, switching from dramatic to comic with ease, but the one who truly stands out is Que Haidar as Ozi, who has the most demanding role in the film, as a frustrated, purposeless young man with extreme family issues. Pekim Ibrahim plays the archetype of the "cool guy" with gusto, in a role without many demands though. Overall, "Ophilia" is a film that entertains through its chaotic style, although it will definitely leave its audience perplexed regarding the way it manages just that.